On 21 February, a severe earthquake hit the city of Christchurch. Satellites quickly swung into action to cover the disaster for the International Charter on Space and Natural Disasters. The earthquake hit the city of Christchurch on 21 February. Credits: NASA/GSFC. 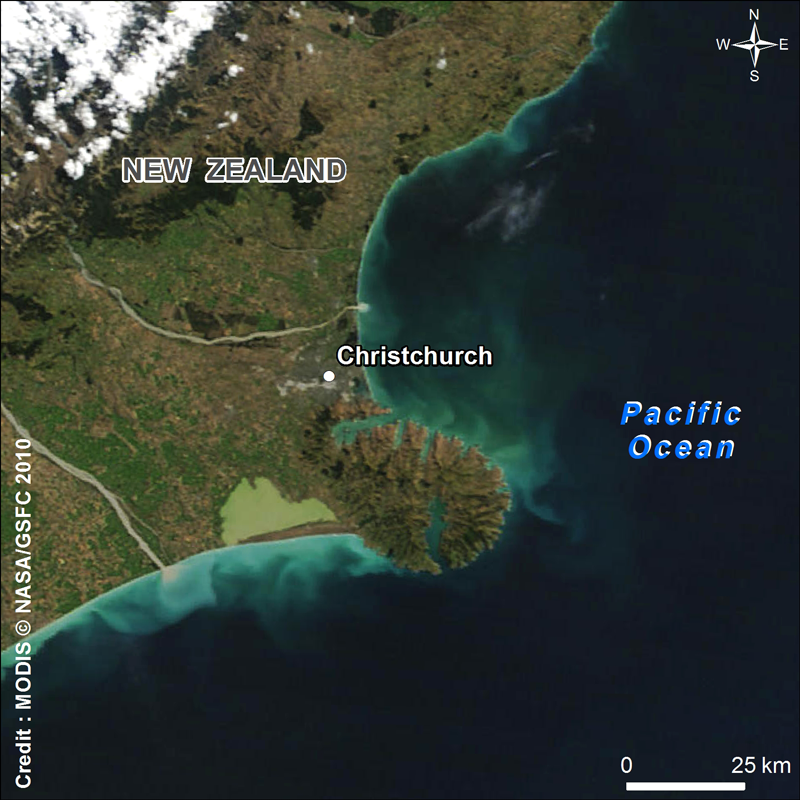 At midday on 22 February, a few hours after the tremor hit New Zealand, the International Charter on Space and Natural Disasters was activated by the French civil protection agency and then by the United States for New Zealand’s civil protection teams,” explains Claire Tinel, Project Leader for charter activation at CNES. 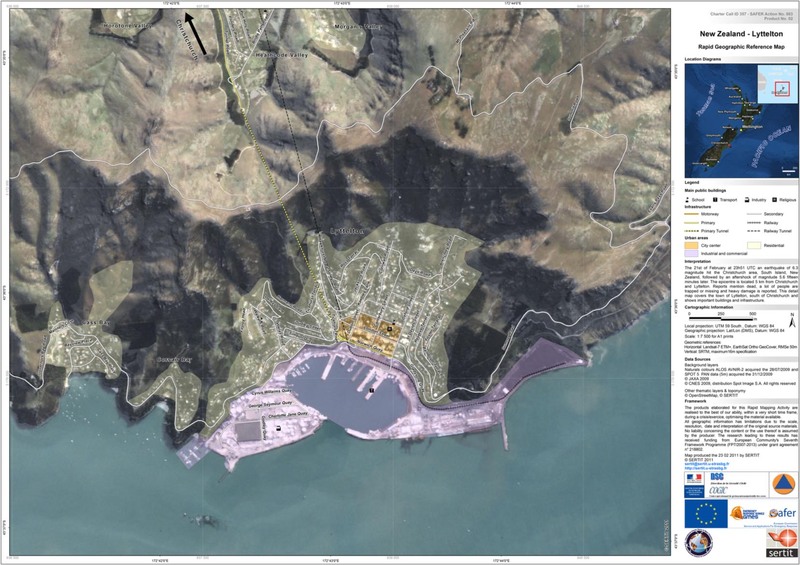 Claire Tinel subsequently asked charter member agencies1 to task their satellites immediately to cover the disaster area. 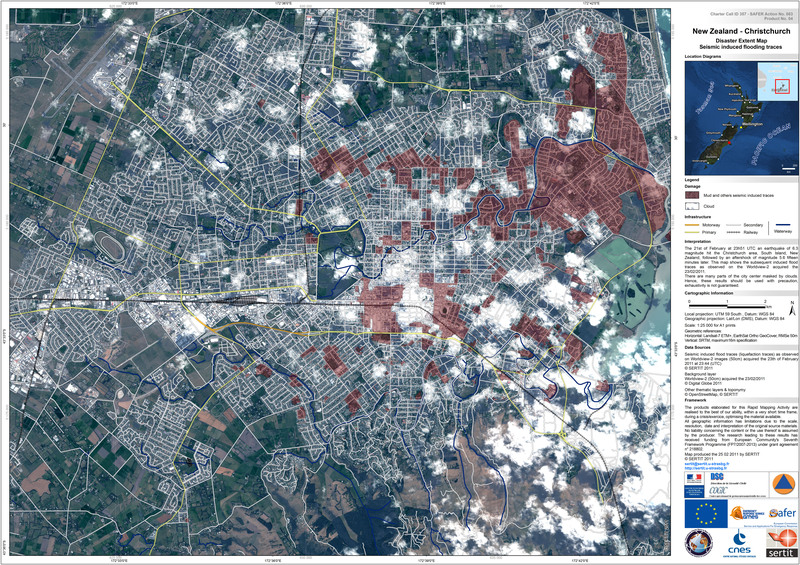 Their mission: to obtain high- and very-high-resolution imagery of the centre of Christchurch in order to map the damage inflicted by the quake. Buildings can be made out on this map. Credits: Digital Globe - Map produced by SERTIT. The 6.3-magnitude earthquake seemed mostly to have affected large structures and old buildings in the city centre. This is where emergency teams concentrated their initial efforts to rescue some 50 people trapped under the rubble. Interferogram highlighting ground displacements. Each colour fringe represents a post-tremor displacement of 11.8 cm. But the relief effort was only just getting underway. On 25 February, French scientific teams3 obtained radar images from the Japanese ALOS satellite and worked through the night to produce an interferogram, a map highlighting ground displacements caused by the earthquake. New Zealand lies astride a region of the globe where the Pacific and Australian tectonic plates meet, so many faults run through it. One of these faults is under the city of Christchurch, generating ground displacements every time there is an earthquake. Basemap generated from ALOS AVNIR-2 and SPOT 5 data. 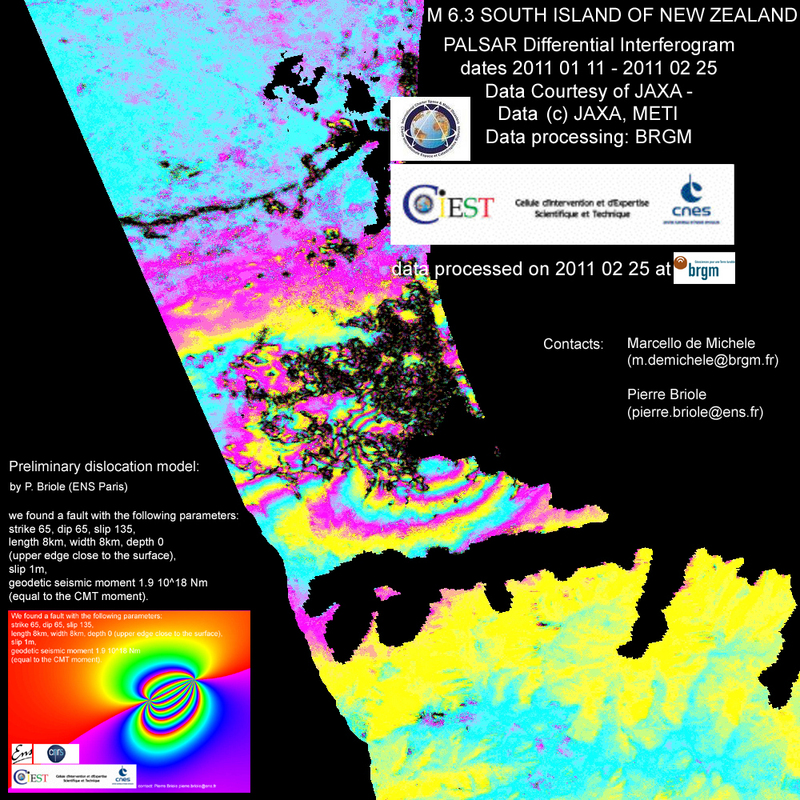 Credits: JAXA, CNES - Map produced by SERTIT. A previous earthquake occurred in this region as recently as September 2010, but there were no victims on that occasion. It is now highly likely that New Zealand will experience more aftershocks in the coming months. 1 ESA, CNES, CSA (Canada), NOAA/USGS (USA), ISRO (India), CONAE (Argentina), JAXA (Japan), BNSC /DMC (United Kingdom) and CNSA (China). 2 Service Régional de Traitement d'Image et de Télédétection (regional image processing and remote sensing department, Strasbourg University). 3 Bureau de Recherches Géologiques et Minières (BRGM), Institut de Physique du Globe de Paris (lPGP) and GNS Science (New Zealand).